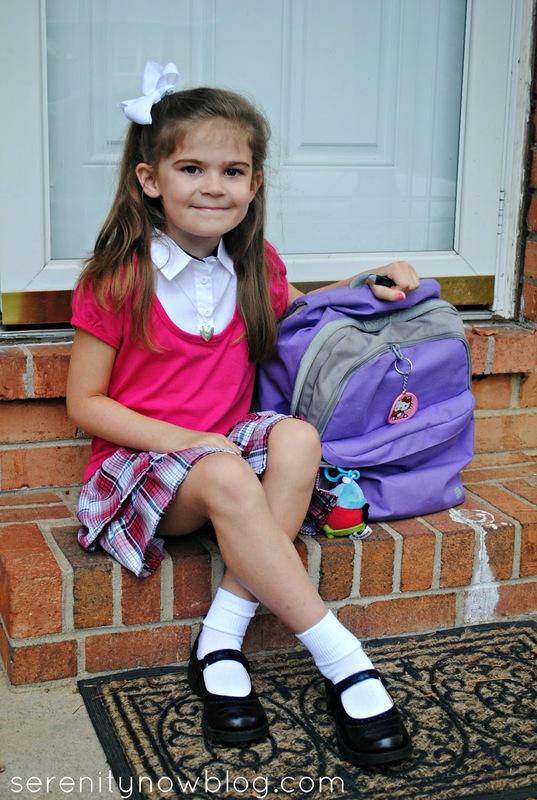 When I shared my new Teacher Survival Kit yesterday, I mentioned that Natalie was off to first grade at a new school. How is it possible that I have a first grader? Still little enough to pose willingly with her younger sister and to want to walk to school with her mommy and daddy. Michaela Byrd doesn't start preschool until September, so we have several weeks of one-on-one time. The house was, ahem, quite a bit quieter today! We filled the day with puzzles, coloring, Play-Doh, books, and...yes, Target. At 3:25, the verdict on first grade was mixed. I knew switching to a new school and attending all day would be a big adjustment, but she met a few new friends and loved her reading book (ironic because getting her to work on reading this summer was like pulling teeth). Hoping that the rest of the week will allow her to relax and enjoy school! As for me, this first grade stuff will be an adjustment for me too. I'm going to enjoy the next couple of weeks of together-time with my four year old before she starts preschool three days a week. Then it's on to a Fall To-Do List and gearing up for a year of fun. Has school started in your area yet? 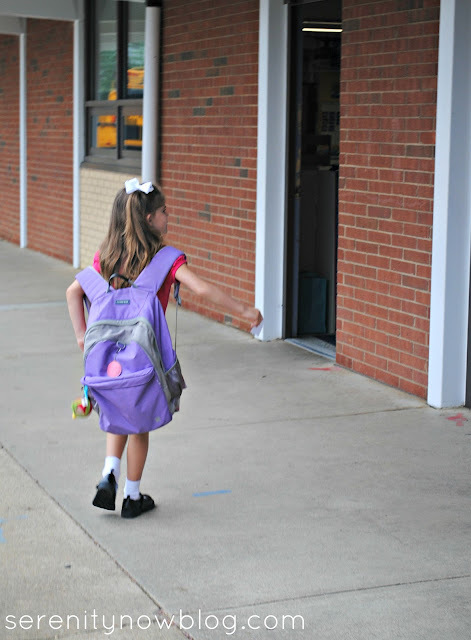 Any good first day of school stories for me? Preston went back to Carolina over the weekend; Lee starts school today; Will starts classes (his last year!!) at Duke on Monday. No matter how old they get, it always tugs a bit at Mom's heart when they go off to school! Can't believe Natalie is already in first grade. Aren't you glad she did half-day kindergarten last year? A full day of school is a LOT. But I'm sure she'll be a champ! I cry in the first day every year - and it always surprises me that I do. She looks darling! What a sweetheart! Her book bag looks so big on her :-) You must be one proud mama! I know she'll do great! Your daughters are soooo cute! My son starts school next Monday; he will be attending a new school too - he's starting 7th grade, so will be going to middle school. Enjoy the one on one time with your younger daughter! I'm a wreck over pre-school, I cannot imagine what I will be like when my kids are in first grade. 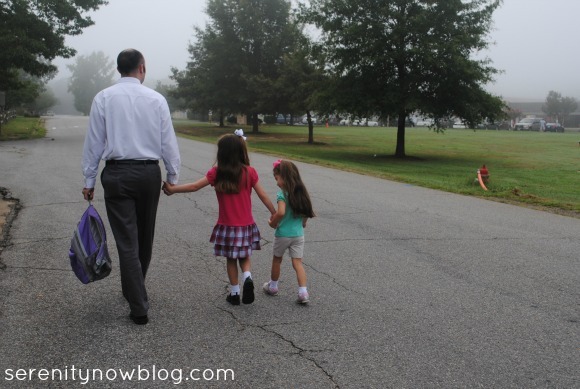 I talked today on my blog how my kids aren't babies anymore. I must say though, I am excited about how much more will get accomplished while they are at school. aww, so sweet. love the picture of the girls holding hands with your hubby. Such a big girl. My boys still pose for pics...but not really willingly:) Is her new school close enough that you can walk her there? That would be nice, because the traffic to get mine to school and home again is terrible! My first grader doesn't start until next week.. and my preschooler doesn't start until September, but I completely see where you are coming from. I am exactly in your shoes too. They grow up so fast! Even though every day seems to go on forever. The days are long but the years are short! Ahhh....1st grade. I remember it well. Such mixed emotions. We also have two girls. 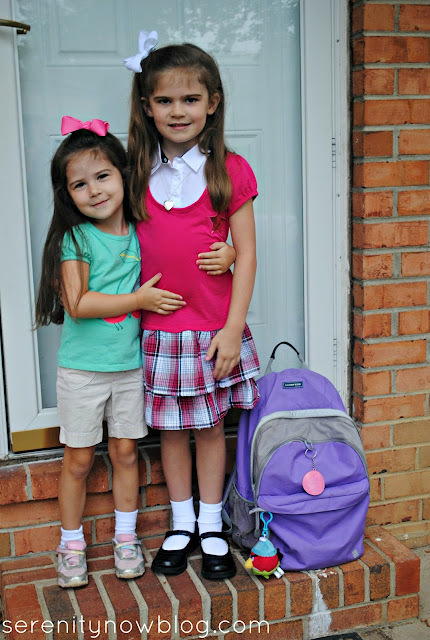 I cherish all the First Day of School Photos we've taken...and now they are truly big girls, as one graduated college and one is a college sophomore. I still have them take first day of school photos for me! Where did the time go? Enjoy every moment.